This movie was kind of a big deal back in the day – a high-profile big screen adaptation of Umberto Eco’s celebrated 1980 book. It’s a medieval mystery linking biblical analysis, history, and medieval and literary studies under the blanket of a whodunit. In many ways it was an intellectual Da Vinci Code, as it involves a pair of monks solving historical puzzles and murders while avoiding the infamous Papal inquisition. Unfortunately, despite the acclaimed source material, it’s not much more than a disguised and disposable Sherlock Holmes story with little intellectual resonance. 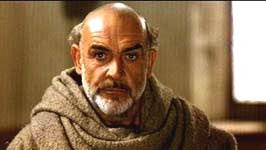 Sean Connery plays a progressive and rebellious Benedictine monk, William of Baskerville, who is sent with his aide, Adso (Slater), to a Northern Italian monastery to participate in a theological conference. When they arrive they discover that a monk has recently died after falling from the top of a seminary. William is sharp and senses a cover-up from the shifty-eyed Abbott (Lonsdale). His application of sharp logic and deduction uncovers a plot to hide a library of outlawed books by the ultra-conservation monastic order. Later to arrive is William’s rival Bernardo Gui (Abraham) of the Spanish Inquisition. You know those cloaked god-fearing despots who killed or imprisoned anyone that threatened the power of the Church. But with monks and priests dying left, right and centre, clearly there’s something in that library worth risking being burned at the stake for. Connery seems perfectly cast. He has a naturally bald head, a commanding cinematic presence and a large amount of charisma. He plays a typical Sean Connery character, a whip-smart cocky leader who often goes against the grain, but is so superior to everyone around him that he’s practically ‘untouchable’ (pun intended). His dialogue consists of asking questions of his protégé, Adso, and then confidently stating the exact opposite to Adso’s answers. The Name of the Rose works best as a 'semiotic' puzzler, an anthropological discipline which connects signs and other forms of communication across time and cultures. It’s a popular field in the present, popularized by the Dan Brown novels and dumbed down even more in the National Treasure series and even to some degree in the Harry Potter series. Unfortunately, the discoveries and revelations made by William and Adso in the monastery never connect in a satisfying way to the present or to our understanding of religion as a whole. The conflict with the Inquisition is frightening. It’s an organization that for hundreds of years held the Western world back from scientific progress. F. Murray Abraham is deliciously villainous as the nasty lead inquisitor, and the other monks, who because of their faith remain mostly silent, represent a creepy, malign presence in the opening scenes. James Horner’s sparse but effective score helps create a tone of dread. The plotting of the narrative fits into the whodunit mold. Thankfully, the film mostly avoids the ‘Scooby Doo’ moment when in the third act the villain reveals himself and tells us exactly how he committed the crime. This doesn’t happen, but the filmmakers do resort to a rather shamefully explicit sequence of exposition telling and showing the audience what William has solved in his head. By the end we are moved and barely even intellectually stimulated. Instead of a revered, enlightened novel, The Name of the Rose feels like disposable, airport paperback fiction. The Name of the Rose is available on Blu-ray from Warner Home Entertainment.